William was thrilled to be invited to take part in the Open Arena Eventing competition held at the Central Park Horse Show in New York City this weekend. He has been kindly lent a horse by Anna Loschiavo called Prince Renan. Renan has competed up to CCI2* and is a 14 year old Holsteiner/Thoroughbred cross. William has had a sit on him for the arena familiarisation and has reported back that he is spooky but nice with a good jump. Photo: Mark Bellissimo (CEO of International Equestrian Group who organises this amazing show) with William and Oli in their Team tops. Twenty four international three day event riders have been invited to compete this evening. Riders have been placed into teams of two and the teams are named after significant New York City locales. 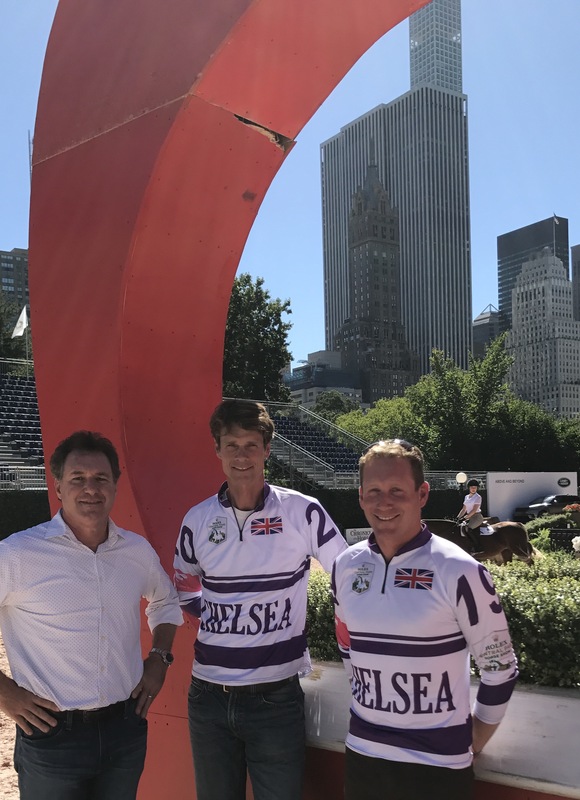 William has been paired up with Oli Townend to form a GB Team named Chelsea. Coverage starts this evening at 7.30pm NY time (12.30am tomorrow for UK time) and can be watched on http://tv.coth.com.